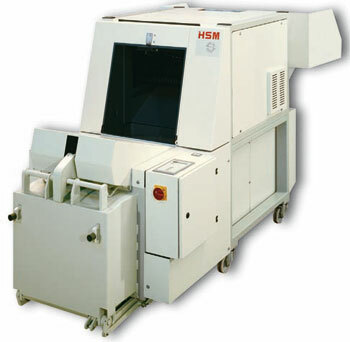 In terms of economic efficiency the HSM SP4980 is very difficult to beat. It combines power and convenient operation in one compact power-pack like no other device. 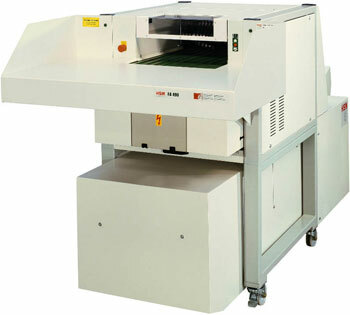 High performance conveyor belt document shredder, combined with convenient baling press (FA 490.1 and KP 80). Material intake via large loading table and electric conveyor belt. Keypad control for constant operation and reverse as well as automatic reverse in the event of a paper jam. Integrated, manual oiler for cutting unit (particle cut version only). Modern SPS controller with multilingual display and convenient menu navigation. Photoelectric cell for automatic control of the pressing process. Shredding and pressing conducted simultaneously. Material compressed directly in the waste bag (basic equipment: 5 plastic bags). Display for finished bales.